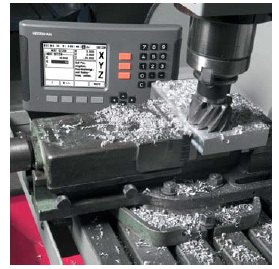 By retrofitting your manually operated machine tools or measuring equipment with digital readouts from HEIDENHAIN, you've made a decision for increased productivity, higher precision and more operating ease. Regardless of whether you're installing on new equipment or retrofitting machines already in operation, HEIDENHAIN digital readouts can easily be retrofitted to any model of machine or type of equipment, whatever the application and number of displayed axes. Digital readouts from HEIDENHAIN will save you valuable time. The distance-to-go display allows you to move swiftly to the next nominal position, simply by traversing to the display value zero. Or, you can use the function for setting multiple reference points to enter position values quickly and without tedious calculation work.